Lately, I’ve been thinking a lot about what I want to sew, what type of clothes I like to wear, what fabrics, what colors, etc. Not just thinking, but reading books, blogs and other websites dedicated to image, wardrobe building, and color theory. I already have a favorite coat, a few pairs of suitable shoes, and an appropriate handbag. I have a small collection of scarves that needs to grow a little bigger, and my belt collection is dismal so that will need work, too. So, that’s my dream wardrobe. We’ll see how it works out in real life. I have also been doing a lot of thinking about wardrobe planning. So far, I have not nailed exactly what I need to suit my lifestyle. It looks like you have a really good plan. I can’t wait for part 2. So are you going to use this as the jumping off point? Will you assign patterns to these looks and sew them up? Or is this just your dream wardrobe? Oh, one more question…no white blouse? Great idea. You’ve got a starting point, can bring it together, and evaluate and shift as necessary. Good luck. Excellent plan. It all starts with a vision. 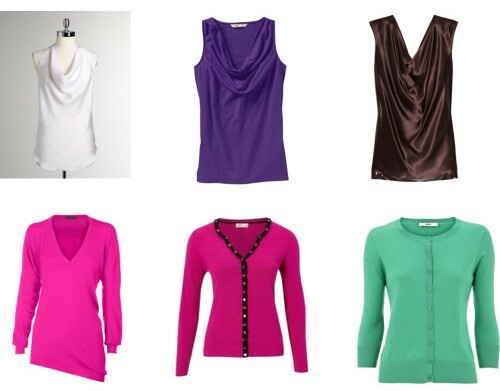 I love the sleeveless, cowl-neck blouses you’ve included. They always look beautiful under jackets. Good luck and keep us posted! These styles will look fantastic on you. Glad to see you introducing lots of colour.